There are many ways for people to find out that they are at risk of having a heart attack or stroke, the scariest of which is having one. Or, like the 56-year-old women in the photo above, who stopped at one of our blood pressure clinics to find out, much to her shock, that her blood pressure was 247/152…a life threatening blood pressure. The Peterborough Regional Vascular Health Network is able to offer the people of Peterborough and surrounding area the opportunity to be assessed for vascular disease. This assessment will help determine ones risk of having a heart attack or stroke. Read on to learn more about the Vascular Risk Optimization Clinic (VROC) and to find out how you can become involved. The VROC is a program that optimizes vascular care facilitated by a team approach of cardiologists, family doctors and specially trained nurses. Improved vascular care, with a focus on prevention, decreases vascular disease. Simply put, this leads to fewer heart attacks and strokes. Vascular disease poses many problems for people. The number one problem is that often there are no symptoms until a real problem occurs. We know this; we have talked about early intervention and prevention for decades. The VROC puts our knowledge into action. We look for vascular disease and do something about it before it shows itself in catastrophic ways. Strokes and heart attacks are scary business. The VROC empowers people to take positive steps away from vascular disease and towards vascular health. We are most interested in helping those that do not know they have a problem brewing. Aware, or think that you might have risk factors for heart attack or stroke, such as high blood pressure or high cholesterol levels. In an exceptionally high risk occupation, such as fire fighting. From a family with an exceptionally high incidence of vascular disease. If you do have a family doctor or a nurse practitioner we will inform him/her of your interest in our program and keep them informed of your progress. If you do not have a family doctor, we will manage your vascular health but unfortunately cannot take on the role of a family doctor. You will be meeting with a Registered Nurse. A medical history will be acquired. Baseline blood work, EKG and blood pressure will be obtained. In most cases, ultrasound will be utilized to assess the carotid artery for structural changes. 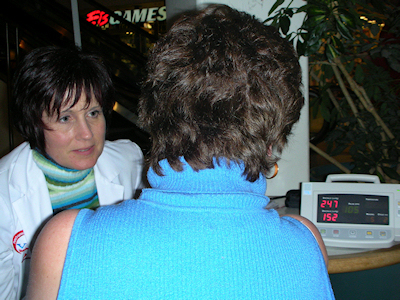 A cardiologist will also be directly involved in your care. Further cardiac testing will be done as appropriate. You will be seen, in follow-up, by a nurse as needed, on an individual basis. You will receive counselling regarding the initiation or titration of medications, if necessary. You will set goals in relation to your own personal risk factors. Support will be provided to help you reach them. Risk factors such as smoking, diet, exercise, alcohol, diabetes control, and hypertension will be reviewed with the purpose of improving your vascular health for years to come. We congratulate you on taking the opportunity to learn more about and improve your vascular health. The most important thing about vascular disease is that it be found and managed.